Ninja.org is a recent opportunity I found out about where you can quickly and easily make predictions and bet against other people in Ether. 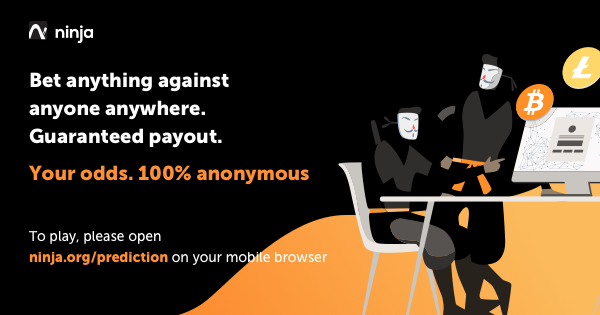 Ninja claims to be 100% anonymous because their platform doesn't require any personal information in order to sign up. There isn't even an app that you need to download on your phone. All you need to do is visit Ninja.org, and the website will automatically create an Ether, Bitcoin, Bitcoin Cash, or XRP wallet and you can send the funds directly to that wallet. Of course, it is important to backup your wallet the first time you send anything to your address. With Ninja you can scroll down on your phone to see predictions that are being made and choose to enter any of the available bets going on at the time. There doesn't seem to be any restrictions on the types of bets you are allowed to make on this platform from sports bets to how many Tweets per day Donald Trump will make, lol. Also, Ninja recently released a new feature where you no longer have to rely exclusively on mobile to make predictions because you can add a chrome extension to your chrome browser and it will create a ninja wallet within your browser similar to the way Metamask or Trust wallet works. I have to say it is very easy to make a bet using Ninja and they have reasonable fees on the platform. However, I will say that with Ninja there is a market fee that can be set by the person who created the bet and this is set at 1% by default, but it is possible to raise this market fee to at least 5% for creating a prediction that could have taken you only 30 seconds, so that doesn't sound great. Ninja.org also doesn't allow you to easily sort through the different bets or different categories of bets on your phone which would be very helpful if you were looking for a specific type of bet such as a sports or music related bets. Lastly, Ninja.org will prompt you to get 2 free bets worth .03 ETH just for entering your e-mail address. Since they are giving away free bets or you can make small to large bets of Ether on each prediction it is probably worth your time to consider using this website. However, I'm wondering if there is a better website out there to make predictions on such as Augur, but I have not used this myself. I'm not endorsing Ninja in any way, I'm just exploring what's out there.